So this weekend was good ... up until Sunday round lunchtime. But more on that later. Probably sould've written this all down last night but I was busy (luckily) and now I'm in a bit of a rush since I only have half a day here at work before I'm off on the leadership course this week. Friday evening Loulou and I had a quiet night at home with mini pita-pizzas and a couple of dvds. The dvds were not ideal since I've generally seen just about everything on big screen, so I was holding out for saw 3 and accepted there'd be at least one that I'd already seen. Deja Vu I've reviewed already. It's rubbish. I was never a huge Ali G fan either. And I'm not a huge fan of this sort of humour. That's really all there is to say about it. Then I went on a bit of a shopping spree before I had to head to work for another implementation. This one went smoothly :) Then there was more shopping ... since I was missing the rugby already, might as well make it count ;) I thought I'd be one of about 3 people in the malls but I can tell you that I didn't even notice a thinning in attendance. Oh well. Then it was home to wait for Loulou to get back from the rugby. Started watching a new series called Extras. I preferred it to The Office. The Loulou and I got all dolled up and headed to her friend's 31st birthday. Stayed for about 2 hours or so and then headed to a house party we'd been invited to by Phlippy & Lord Wiggly. That was quite a fun evening :) Better than most house parties since they had a barman and a DJ. But didn't really meet too many interesting new people ... at least no one I'd ever need to see again. And then it was home fairly early at midnight since the few people we knew there had all just about left themselves. I think it was my early morning Yoga kicking in too ... plus I'm out of practice at the whole party-scene. Then I had a good laze-in on Sunday morning. Finished reading my book. Then Loulou and I went and had sushi for lunch. And this is where things took a turn for the worse. I'm still not really sure what happened, but it did. I chatted to Varen, on his way home from his diving weekend. I wanted him to join me for movies later in the evening, since he'd said he'd be popping in on his way home anyway. And he got really angry with me about having been to the party the night before. The conversation ended abruptly and led to a number of confusing smses. I could tell he wasn't happy. So I left things alone for a while to cool off and finished watching Extras. Then I called him. I'd decided to do a double feature at the movies (haven't done that in years .... since I dated ActorWriterDirector, actually) and would therefore not be able to chat to him when he arrived home. I invited him to join me for the second movie, if he was in a better mood. And here, on the phone, while he was driving with 2 of his friends in the car, the conversation got heated. I'll never know if he was planning to end it on Sunday evening all along, was that the reason he was gonna come over? I'll never know if it's because he had a far better time on the weekend away from me and our continual ups & downs. I'll never know how much he got talked into finally making the decision by his friends who were there with him ... they don't really think we're such a marvelous idea. Either way, things are really, no-speaking even, over. I guess that's what happens when you end things (can't really say break-up since I couldn't really say we were dating) over the phone. It's far more final and you're not there to hug the person and see their emotion. I am sad about all this, but I understand why it eventually had to happen. So, I couldn't stop it happening. With an ultimatum like date me or nothing, when I clearly can't date him, what options am I left with but to gracefully bow out and let him go. He'll survive this, I'll survive this and maybe one day we'll even speak again. It's hard to realise that this is really the end. I'm going to miss him. There'll be no one to watch series with and no more bike rides. And I wish I could figure this whole thing out. I don't know why I couldn't date him. Things were sometimes so good between us, but Ijust couldn't commit to it and have it turn into a full-time thing. I wish I knew what was holding me back ... but I don't, it's just a funny feeling inside me that stopped me every time I thought maybe. So after that I went to hide. 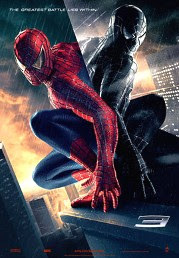 I watched my double feature of Fracture & Spider Man 3. If you look close enough, you'll find everyone has a weak spot. 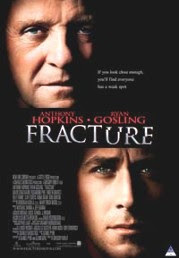 Anthony Hopkins and Ryan Gosling star in the dramatic thriller Fracture. When a meticulous structural engineer (Hopkins) is found innocent of the attempted murder of his wife (Embeth Davidtz), the young district attorney (Gosling) who is prosecuting him becomes a crusader for justice. Fracture is packed with twists and turns that weave in and out of the courtroom as the pair try to outwit each other. Fracture looked to be good ... but turned out not completely fabulous. I spotted the twist the instant it happened and boredly waited for the characters to catch up. How long can any man fight the darkness... before he finds it in himself? In Spider-Man 3, based on the legendary Marvel Comics series, Peter Parker has finally managed to strike a balance between his devotion to M.J. and his duties as a superhero. But there is a storm brewing on the horizon. As Spider-Man basks in the public's adulation for his accomplishments and he is pursued by Gwen Stacy (Bryce Dallas Howard), who rivals M.J. for his affections, Peter becomes overconfident and starts to neglect the people who care about him most. His newfound self-assuredness is jeopardized when he faces the battle of his life against two of the most feared villains ever (Thomas Haden Church, Topher Grace), whose unparalleled power and thirst for retribution threaten Peter and everyone he loves. Spider Man 3 I found as disappointing as it seems everyone else has. It's pretty slow and I thought quite tedious. Oh well, it had to be watched. He didn't show up for the second movie. I still thought he might and make everything okay again, but he didn't. It really is over. And that was my weekend. Things are strange this morning. Got a good-bye email from Varen. I can't deal with this right now. I only have a morning at work this week and I've spent half of it blogging so far. I need to finalise and pay for my Kenya-Uganda trip and go to a couple of meetings. 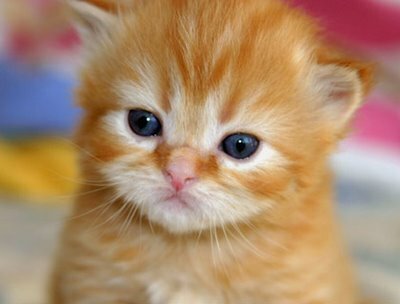 I am sad. This is life. You watch way too many movies. Is there such a thing as too many movies though? Hey Philly - I hope you're doing alright and not stressing too much. Stupid men. There is no such thing as too many movies.